Guojun Hong (Kuo, Chun-Hung) Liu Qian is the magic of the first teachers in about 20 years ago, accumulated from the hands of Liu Qian cheated 20 million NT dollars. Appeared in the big mirror on the wall a second time, said this, Liu Qian admitted, Liu Qian was crazy the whole time. 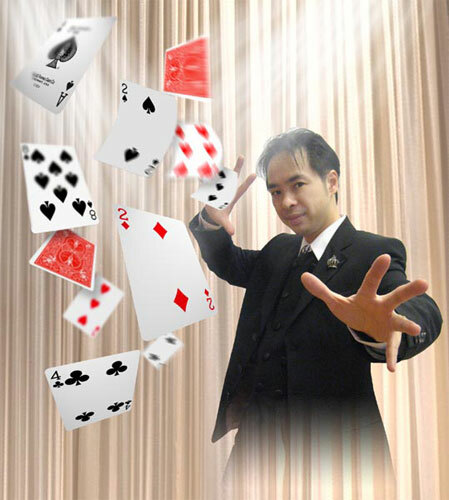 Guojun Hong studying magic for 20 years, has 10 years of extensive performing experience, is a full-time professional magician. Guojun Hong specializes in close-ups of interesting magic show, consisted largely of the delicate magic, balloon modeling with joy, is the very unique performance style. Interactive program full, the process of inviting audience participation, fun with the audience, especially in the table table in front of Magic; use readily available audience on the table tableware, performing a series of amazing magic, known as "King Magic Life . " Guojun Hong interview, the exchange of business cards had first met, I did not realize he opened the wallet, an SSN oncoming fire, and threaten the press jump, he also play the fool: "Oh! 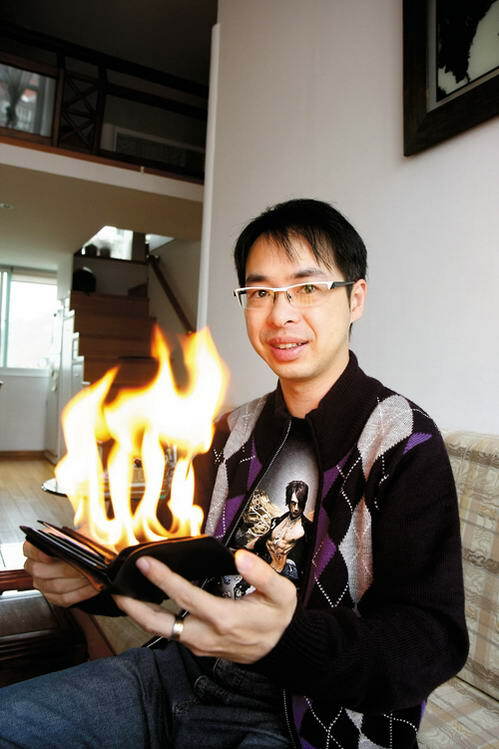 Sorry, do not care to get Magic card holder. " Liu Qian childhood lead past the door, but not allowed to knock too far in the master Guojun Hong, accepted an exclusive interview stunned the newspaper: "His childhood was not smart, or even considered stupid!" Guojun Hong said that 20 years ago, its still just a young man in his early 20s, because I like magic, the year the only magic props in Taiwan "black cap companies" to work, the then boss of children department stores in Taipei, with counters. When SALESWOMAN sudden departure, he volunteered to work overtime station cabinets, superb in Taipei kids in mind the "magic big brother." Many small fans in the humble little man Liu Qian, the year before the fifth grade, do not open eyes always half open, like a live catch was just dozing off, "he was in the case of the most vigorously, and stood his cabinet almost two years to report every day, every few days and finding my new magic tricks, can not let this little loyal fans down. " Guo Junhong he recalled that Liu Qian parents very strict control, but it assured him run department store a day school of magic, "he should be pretty good school work", often test to get 100 points to hold papers with Liu Qian parents for a few hundred NT dollars in pocket money, went straight to a department store, to buy the latest magic props Guojun Hong recommendation. "This year alone, put his pocket money, they gradually changed, nearly 20 million NT dollars in my pocket." Guojun Hong laughs, so many years the two have remained Guo Liu Mentor friendship. Last year, once in the Taiwanese variety show "Dom King" on the encounter, both master and apprentice is also interesting as a program to take this past the "stem", the audience laugh. Guojun Hong admits: "Even the really quite hard to teach him magic, and many other tips would be a school, but the slow foot slow hand-Qian Liu, comprehension worse off than most people, that is, not learn them." But not since childhood Liu Qian a fighter temper this show, can not learn the skills, he must train hard to go home, "after a few days later, he come back to you to see change, you will be surprised that he should be able to become better than you! " This ability depends to come, the hard-won. Guojun Hong recalled the summer of 1988, Taiwan has sponsored an unprecedented contest for children magic, Guojun Hong "coveted" first prize of NT 50,000 yuan, Liu Qian left hand, the secret trick to teach the age eligible sister came to power pinch, did not think Lu Chen first prize being taken away. Children's Magic Competition that year can be regarded as an influential event in Taiwan, the world's top magician David Copperfield has personally come to Taiwan to act as judges of Ceremonies. With one "child" word, then only 12 years old Liu Qian was not easy to perform. His well-known children's show host Tao Dawei (David Tao father), in Tao Dawei play funny thief, stealing around in the food market, Liu Qian was found trailing along after him, and to loot a piece Taking a change to my own hands, and then returned to the rightful owners, the last event of police patrols, Liu Qian Tao Dawei change the handcuffs will be handcuffed to the police. Complicated magic tricks, humorous style and the perfect ending the stage and detonated applause. Guojun Hong dug out the photographs taken that year, remember the old scenery side says: "the year runner-up, second runner-up of two small girls, now all when her mother, left us these old Liu is still modest," Zone "active . because at that time was second, three, and all magic dependents participating employees to arrange for a "snag", lost to Liu Qian did not expect all the participants of this Qinnengbuzhuo. Fang Jian rumors, Liu Qian private is not only less so, even after fame who ignores people are not very entertaining. Guojun Hong was done an injustice for him, he said, Qian Liu wore black-rimmed glasses before, most recently to pay attention to stage effect, with the famous line after the image has not wear glasses, "but he has 800 degrees of myopia, eye allergies can also easily wear contact lenses, remove glasses only vague one, the platform more easily mistakes, the audience blind to those who said that he noticed that people really wronged. " Magic critical know-how required for life on confidentiality, the better the performance, inevitably the more lonely and immense power to bring viewers the joy of others and to step down after the unspeakable Road, there is a gap. Sweating with high myopia, Qian Liu, the stage is still funny and brisk, very human conflicts can think of. On the great day of the explosion of red, and his personal friendship of Guojun Hong also worried: "He's Eager to make amends, not used to fame, pressure is great!" "Dear viewers! Next, is witness to a miracle moment!" Television cameras followed approximation, pressing the desktop Left-hand saw the transparent glass hang a whistle, the coin originally Zhuojiao actually in full view, automatic crashed into the glass, the audience applauded long time can not stop cheering. This is from Taiwan's cutting-edge magician Liu Qian, the CCTV Spring Festival Evening in the competitive, field of three performances in one of the "coin into the cup." Spring Festival Gala over, Liu Qian was once users exceed the number of votes voted for singer Jay Chou, as China is one of the hottest artists in Taiwan. Across the Taiwan Strait, Taiwan in his early forties magician Guojun Hong, also staring at a web simulcast of the CCTV Spring Festival Evening, he noted that Liu Qian's weaknesses, not magic flaws, but Liu Qian hands slightly reflective, "Flow sweating, he too easily worked up! " Guojun Hong fellow magician is none other than requirements Liu Qian childhood haunt science magic every day the big brother. Although Professor Zeng Jing Liu Qian two years, many entry-technology, Guojun Hong still modestly: "Oh, people claim to master the matter, after all, teachers did not formally worshiped." Liu Qian great day watching the performance, Guo Junhong not but lament: "How nice!" Like a happy disciples discerned, also as experts failed to see through the critical and appreciative audience. The only let him or change the hands of Liu Qian Khan: "That's not the hands of users, said grease, how long the magician's hands to practice techniques that point only, not easily greased, and also to play anything, it is He is used to sexual tension, sweating of the hands. " "Frankly, Liu Qian was not very smart kid, or even considered stupid!" Guojun Hong Qian Liu pulls out photographs of a child participate in the competition, inadvertently springing the words, scare the press jump, Guo added quickly: " But he worked hard, been training hard, had the first day of clumsiness, the last more than the naturally gifted players even more severe. " Liu Qian once described: "If there is no 12-year-old that game, I can not magic passion continues to this day!" Like Harry Potter, Liu Qian received the medals from the top magicians in the hands, was upgraded from a Muggle for the Devil 1. But even the beginning of the stage to stir the Devil, never received the Liu family support him, only to magic as interest, according to the expectations admitted to the university, and people accidentally filled Soochow University Department of Japanese volunteers. He became famous years later dared to reveal, majored in Japanese in the hope that one day when he can to the eyes of the most powerful magician Japanese Hiroyuki Sakai in person for advice. Young boy cloth Bureau, the end is inextricably linked with the Magic. Young as extraordinary achievements, Liu Qian is still hard to support by parents, "This is no surprise, then how can I count a professional magician." Guojun Hong said the development of a magic is not easy, risk can not be performed again to show the audience the same time, so that revealed the secret signs from the drop, which is why it rejected former magician on TV's sake. Not on TV, Magic can only be gathered in a number of live performances interspersed the recipe for the two new cycle of three old to play in the first half all over Taiwan for three months, starvation, the pattern is also very much, and parents should worry about the future of children way out. Later, the variety show "Dom King" will be Taiwan's magic lovers gather every Saturday in front of television cameras with each other, soared in popularity while drawing up the realm of magic as a whole lot, described as "failure is also television, Success TV. " After quadrupling the cost of fame appearance, circular drive around Liu Qian, each month fixed to the "Dom King" twice, each time a fixed unit on his own show. Job salary is not high, Liu Qian was personally designed to insist on performance, the audience is different every time to bring the "witness a miracle" moment. Seeing Taiwan's magic circles to downtown from the pioneers Lanlv lush, Guojun Hong Liu Qian contributed directed, "but for his innovation in television, the Magic would not be so popular to this day."